In CERTIFIED COPY (Copie conforme), English writer James Miller (William Shimmell) has written a book in which he argues that copies and forgeries of a work of art have just as much value as the originals, so long as people perceive them to. As if to drive home his point about how perception affects worth, the book has met with little positive response in his home country, but has fared somewhat better in Italy, where Miller is giving a book signing as the film opens. A woman (Juliette Binoche) shows up at the signing with her young son in tow. There is a sense that she knows the author, but when they meet to embark on a tour of artistic sights, it is seemingly for the first time. As the two talk, frequently about the merits of the argument Miller expresses in his book, and how those arguments may or may not apply to life in a broader sense, a funny thing happens: the two begin to act as if they have been married for several years and have a child. As Michael Barrett points out in his excellent article “While We Were Dreaming: Millennial Unreality at the Movies” in Video Watchdog #152, there have been a number of movies made since 1999 that take the position that reality is less concrete than we'd like to believe, and largely dependent upon perception. The trend runs through everything from mainstream sci-fi thrill rides like THE MATRIX and INCEPTION to arthouse dramas like MAGNOLIA and SYNECHDOCHE, NEW YORK. Add Abbas Kiarostami's CERTIFIED COPY to that list. The particular brand of cinematic unreality on display here goes back much further than the turn of the millennium, though, often reminding me of the 1961 classic LAST YEAR AT MARIENBAD. That earlier film featured a similar plot about a relationship that may or may exist. 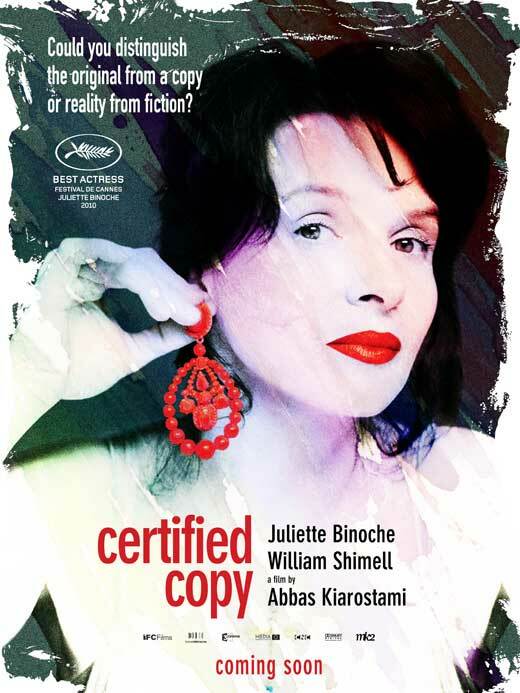 Of equal or perhaps even greater thematic importance, CERTIFIED COPY also explores the cost the passage of time and the mere routine of living can take on a relationship. Even if the relationship in question here is not "real", the emotions around it are. Despite the artifice of the film's construction, the stars manage to convey considerable emotion. Binoche is compelling as always, and opera singer turned first-time movie actor Shimmell proves an equally riveting screen presence. And yet, if I'm being completely honest, I have to say I found myself losing interest at times. With a movie like this, it's difficult for it not to feel like the director is just indulging a formal exercise, and at times that's what it seemed Kiarostami was doing. Certainly that charge could be leveled at MARIENBAD as well. There was something about MARIENBAD which grabbed hold of me and never let go that seems to be missing here, though. Or maybe I'm missing something, as many other critics regard CERTIFIED COPY a bit more highly than I. I guess it's just a matter of perception. 3 out of 4 stars.